18 / Deep / Medium / 32.10 mm / Medium wide. / Our best-selling mouthpiece for all-around work. Has an even high register, substantial tone of excellent carrying power. 24AW / Deep / Deep / 31.25 mm / Wide, well rounded. 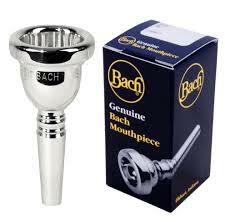 / An excellent mouthpiece whenever a sonorous, dark tone quality of enormous volume is desirable.